This is plate 39 from William Hodges' book 'Select Views in India'. 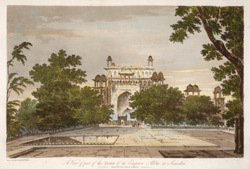 Hodges went to Sikandra in 1783 and described Emperor Akbar's tomb as "one of the greatest monuments of Moorish grandeur". It stands at the centre of a big garden, enclosed by high battlemented walls with four gateways of red sandstone. The main entrance is to the south and an avenue of tall trees leads to the tomb, which stands on a low marble platform.